Towing and trailers offers a car transporter trailer hire using a 2016 Meredith and Eyre3500kg Tiltbed Trailer. 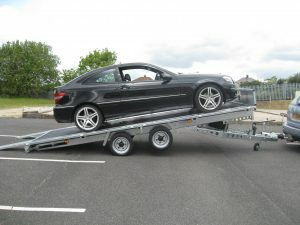 Our Tilt bed trailer can be hired to carry most cars. dimensions of Length 5.2m (16’6″) x Width 2m (6′ 6″) and can carrying capacity of approx 2500kg Dependent on the capacity of your tow vehicle. With the above dimensions allowing most cars and 4×4’s and is long enough to carry most vans. This trailer will take most low cars and is ideal for none runners as it is equipped with a winch. This trailer is ideal for heavy loads and commercial usage, as it has dropsides available.